Thinking of investing in self-driving forklifts for your warehouse? Before you make the change, find out about their capabilities as well as their advantages and disadvantages. If you are looking to update your current forklift fleet, contact the professionals at Wayco. We know everything there is to know about forklifts and you can trust us to help you make the right choice for your next purchase. Self-driving forklifts, also known as automated guide vehicles (AGVs) or autonomous forklifts, can function and perform the tasks that a regular forklift does in a warehouse, without a human operator. Because self-driving forklifts work closely with humans, they are also affectionately referred to as "cobots". Self-driving forklifts can do similar tasks to forklifts that are being driven by a human operator. They can move, lift, and stack items. They are programmed to track, monitor, and mimic the motions and actions of their human counterparts. How Do Self-Driving Forklifts Work? The combination of highly advanced computer technology and artificial intelligence (AI) are the reason why we are now seeing the use of vehicles and devices that are not driven by a human. Whether it is a self-driving passenger car or a robotic forklift, the same type of technology is incorporated. Self-driving forklifts use computer vision technology and artificial intelligence (AI) to determine the route that they will take and to navigate through the warehouse. They can also detect and predict the movements of human warehouse workers that they come in contact with. 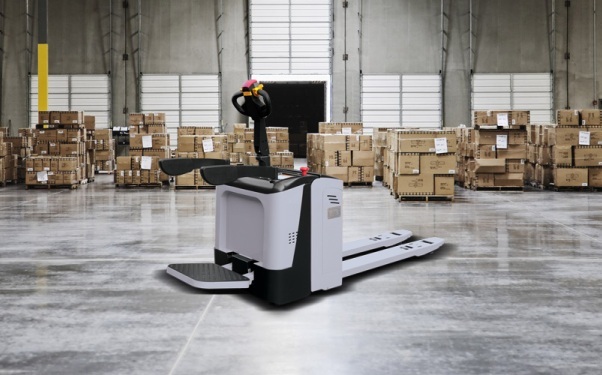 They can sense every detail of the space around them and can figure out the safest and fastest route around the warehouse to their destination, avoiding any obstacles. In addition, they can operate things like warehouse doors and roller tracks all without human assistance. Autonomous forklifts have many advantages as well as disadvantages. With any new technology you should weigh out both the pros and cons before deciding on switching to self-driving forklifts. Accidents caused by human error such as going to fast or not following safety guidelines will be eliminated. Autonomous forklifts will mean that there will be fewer workplace accidents such as drivers injured from a forklift tip-over or collision. Workers will not get back injuries from lifting or moving heavy pallets by hand as the robot will do the heavy lifting for them. Automated forklifts don't get tired, they can work around the clock. They don't require regular coffee or lunch breaks. They also don't take personal or vacation days and they are never late for work. It also means that you won't have to pay overtime or shift differential pay. A properly programmed self-driving forklift will always know exactly where they need to go and what needs to be done. Even with the proper training, humans still are prone to make mistakes whereas a computerized device is much more reliable. There is such a big learning curve involved in the implementation of self-driving forklifts that your productivity may be decreased at first. Once your workers learn how to and get used to working with their automated partners, you will see an increase in productivity. Because autonomous forklifts are such a new, state-of-the-art technology, the price tag to purchase these devices is huge. Over time and as the technology becomes more popular, the costs should come down, making them affordable for smaller to medium-sized businesses. You may find that the training and maintenance costs, particularly in the early days, are very high. You will need to train or hire someone who is able to program and maintain the self-driving forklifts. In addition, you will need to find a place where you can get replacement parts quickly should they breakdown. This may be difficult until the technology becomes more popular and the parts more readily available. Switching to self-driving forklifts will inevitably take away jobs and could mean layoffs in your company. This could cause bad worker relations. However, there will still be a need for human workers to do tasks that the robot cannot do yet, such as wrapping and packaging certain items by hand before they get shipped. "I really recommend to get your lift license here. One of the best courses I've taken in my life, they make sure everything's done the safest ways step by step so you can walk out ready for the job. Angela is the best teacher, very funny but makes sure all precautions are taken. Excellent place to get your forklift or scissor license in Kitchener Waterloo." Newer PostWhat Is a Counterbalance Forklift?